During three fantastic days from 22 to 24 May, people interested in sandy habitats gathered in Kristianstad to discuss management and to learn from Sand Life’s results. The project, that has been going on in the Counties of Skåne, Halland and Kalmar during the past six years, ends during the summer 2018. During these years, the sandy landscape has been opened up and sand exposed. Nearly 500 hectares of pine forests has been harvested and 200 hectares of small trees and shrubs have been cleared. Over 200 hectares of sand have been exposed and 40 hectares of the invasive alien species Rosa rugosa have been excavated. The conference was opened by Annelie Hultén, governor of the County of Skåne, and initiated by project manager Gabrielle Rosquist. The project partners reported on what happened in the three counties while experts in sand history, management and species gave their views on the work. During a full day, the participants were able to look at the clearances in the dune area at Hagestad, Sandhammaren under the direction of the area’s administrator Magnus Jönsson. A stop was made at Haväng, where Verkeån has its outlet and where Dianthus arenarius and Anthericum liligo flourished beautifully in the sandsteppe. A walk through the hilly landscape with Drakamöllan and Kumlan was led by Marit Hedlund and the farmer Niels Lundh. On the last day, the results from the surveys of the habitats and species from the project’s monitoring team were released. Insights were given into small-scale sand restorations in Nybro Municipality, as well as, outlook in Europe how other Life-projects worked with their sandy habitats. During the Conference, a manual was released for restoring and managing sandy habitats to benefit the high richness of animals, plants and fungi. The manual is intended to be a guide for how these habitats can be managed throughout the landscape and are available in Swedish and in English. Participants on the Conference visiting Hagestad, Sandhammaren. Photo Holger Rössling. Gabrielle Rosquist (project manager) talked about the project in general with focus on restoration actions, information and monitoring. Maria Sandell (regional project Leader in Skåne) raised the various sand habitats that Skåne worked with and the cooperation with the Armed Forces in the military training areas. Karl-Johan Pålsson (manager of protected areas in Skåne) talked, among other things, about the challenges of removing Rosa rugosa on the Falsterbo peninsula. Mikael Larsson och Björn Larsson (regional project leaders in Halland) highlighted the costs and the difficulties in eradicating Rosa rugosa from the sand dunes in southern Halland. They also showed the large-scale removal of Pinus mugo that opened up and created a variety of environments in Halland. Jonas Lundquist (regional project leader in Kalmar) showed the restorations of the calcareous sandy grasslands on Öland, where sandy patches were created and Calluna vulgaris cut and vacuumed. The pine forests at Böda/Byrum at the northern part of Öland have been opened up and invasive species have been combated. Krister Larsson (ALLMA Natur & Kultur), who has long experience of working with sandy habitats, raised the problem that man has over-protected our sandy habitats for decades, and by inaccurate management or no management, let these habitats to encroach. A backlash in time also showed how we curbed the sand with various actions such as fences and seaweed. He pointed out the need for a mosaic-style sandy landscape with different stages of succession. Kill Persson (MiNa) raised the two key-words – disturbance and mosaic – to regain a thriving life in the sandy habitats. The recommendations for getting there are – burn, pull and dig. Choosing a machine for what you want to achieve is also of high importance. Mikael Jeppsson (Svensk Mykologisk Förening) gave an insight into the fungi communities of the sandy fields, focusing on the gastromycetes, i.e. the puffball-fungi. The key to favoring these fungi is moderate disturbance which gives open sand in a mosaic with low-grown vegetation. Patrik Olofsson (Eco Images) has sureyes the bird-fauna in Sand Life and could show a positive trend for the sandy bird number one, the Tawny pipit (Anthus campestris). Erik Borgström (Lund University) showed the results from the monitoring of habitats and species in Sand Life. Exciting results that showed, among other things, that Hymenopterans and beetles that are dependent on bare sand have highly increased after restorations. Pål Axel Olsson (Lund University) has conducted research in mainly the xeric calcareous grasslands for more than 15 years and he told us about his results. Among other things, Koeleria glauca was a fast colonizer when the calcareous sand was exposed. Sebastian Ivarsson (Kristianstad University) has specially studied the attitude to Sand Life in Vitemölla and Haväng through a survey and deep interviews. Kevin Benham (Louisiana State University) is an artist from the United States who collaborated with Sand Life through so-called Land Art and his installation Broken kilometer. Olof Persson (Nybro Municipality) has collaborated with the County Administrative Board in Kalmar with small-scale sandy restorations, in particular, to favour the rich life of Hymenopterans found in eastern Småland. Holger Rössling och Stefanie Luka (LIFE Sandrasen, Germany) have restored calcareous sandy grasslands in Brandenburg, habitats similar to the Swedish sandsteppe. Among other things, much has been done to help plants through sowings, planting and hay spreading. Uffe Strandby (LIFE REDCOHA, Denmark) talked about their various attempts to map and combat the invasive alien plant Rosa rugosa in Western Jutland. Roman Hamersky (AOPK, Czech Republic) demonstrated the restoration of two Life-projects focusing on regaining the steppe vegetation and to favour the Continental Sandy Dianthus arenarius ssp. bohemicus. 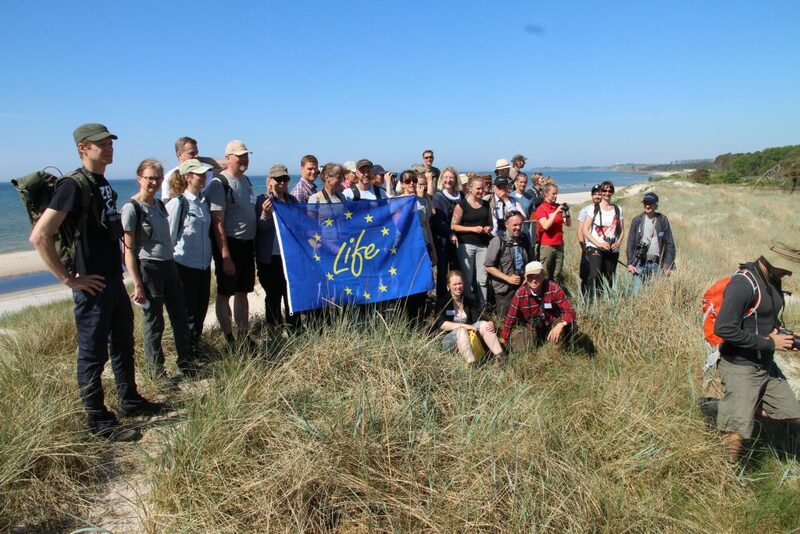 After-Lifeplan (project partners) last but not least insignificant, plans of how the restored sandy habitats can maintain their important structures, such as exposed sand, low vegetation, flowering plants and gaps in the dune forests, were raised.